When you go public with your opinions, you are apt at times to ruffle some feathers, intentionally or otherwise...They are likely to assault you...with a fairly standard two-step method. Step 1 is the deft and veiled conversion of what should be a content-based exchange into an ad hominem attack. Step 2, in the service of step 1, is indictment by innuendo. As it happens, for at least two years, Dr. Katz, a celebrity doctor and the founding director of the Yale Prevention Research Center, has been on the warpath against author/journalist Nina Teicholz using language some might consider to be "ad hominem attacks" and "indictments by innuendo." Since her book (The Big Fat Surprise) was published, in 2014, Teicholz has become an advocate for better dietary guidelines. ...(On September 23) last year she wrote an article for the BMJ (formerly the British Medical Journal), which makes the case for the inadequacy of the scientific advice that underpins the Dietary Guidelines. The response of the nutrition establishment was ferocious: 173 scientists...signed a letter to the BMJ, demanding it retract the piece. ...(Dr Katz) returned again and again to the subject of Teicholz’s character. 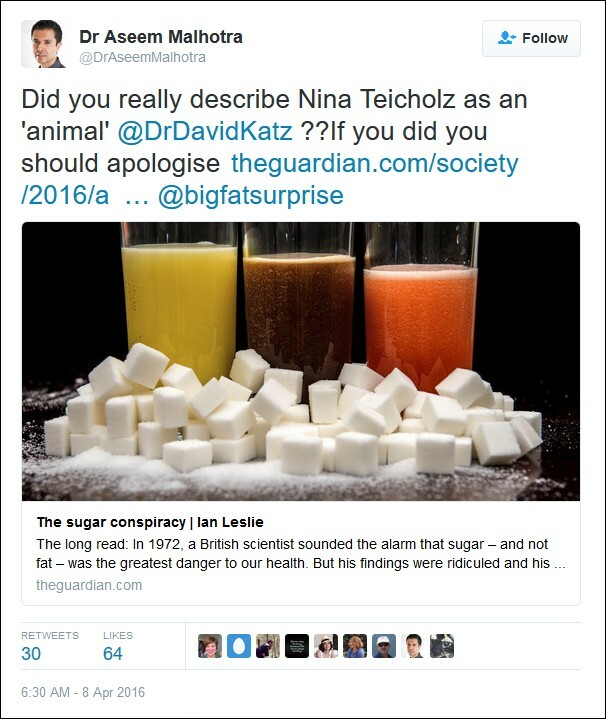 “Nina is shockingly unprofessional…I have been in rooms filled with the who’s who of nutrition and I have never seen such unanimous revulsion as when Miss Teicholz’s name comes up. She is an animal unlike anything I’ve ever seen before.” Despite requests, he cited no examples of her unprofessional behaviour. 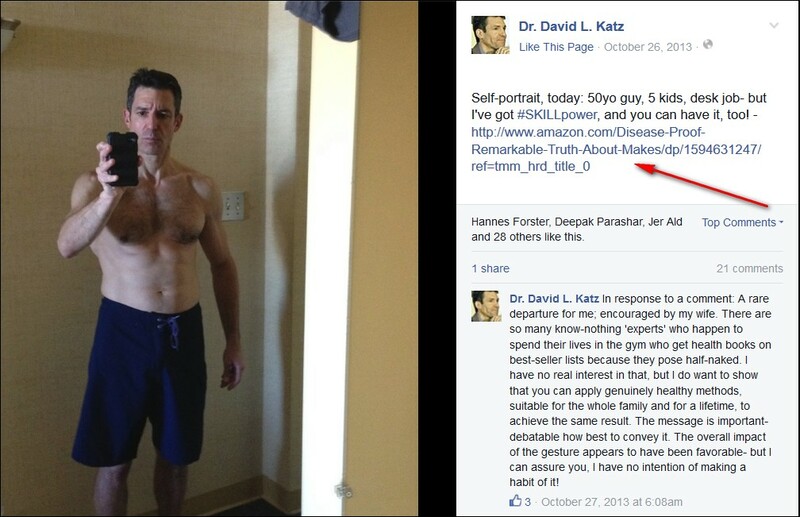 I am writing to you to express my shock and disappointment on the recently published comments of one of your most prominent faculty members, Dr David Katz MD. ...This highly personal, sexist, and vitriolic attack on the character of Miss Teicholz, without any discussion or consideration of the scientific rigour underpinning her ideas, reflects very poorly on the professionalism of Dr Katz. Scientific progress relies on debate and seeking the truth, even when it may not fit With current dogma. Miss Teicholz's work may have caused consternation within the highly polarised nutrition field, however this challenge to the orthodoxy should be welcomed in the spirit of scientific enquiry. Bullying in any circumstances should be abhorred, and in line with your 'Standards of Faculty conduct', and I hope you will be taking this matter further. Dr. Katz's remarks in the Guardian are just the latest round in a fight he picked with Ms. Teicholz even before her book was published. ...The plot then quickly thickens, and goes on to curdle, for we learn at the end of the Wall Street Journal piece that Ms. Teicholz has a book due out next week, entitled The Big Fat Surprise: Why Butter, Meat and Cheese Belong in a Healthy Diet. So whatever else the recent Annals paper is or isn’t, it was clearly a nice marketing opportunity for Ms. Teicholz and her publisher. ...Ms. Teicholz seems inclined to play the iconoclast card. It’s getting old, frankly, but it generally does work to sell books. So she may well wind up rolling her eyes at this column on the way to cash her royalty checks. I am rather stunned that the BMJ published a journalist’s commentary about the work of the 2015 United States Dietary Guidelines Advisory Committee as if it were an authoritative rebuttal. It’s as if someone selling horse paperweights is invited to critique the Olympic equestrian team. It is, in a word, absurd - and testimony to the breakdown in integrity where science and media come together. With all due respect to Ms. Teicholz, she is not a nutrition expert, and not a scientist. She is a journalist herself, and one with a book to sell. She refers to bias, but fails to highlight her own. If the DGAC report is valid, it calls into question her own conclusions - as well it should. She may therefore have suspect motives in seeking discredit this work. ...The notion that the opinion of one journalist with a book to sell is in any way a suitable counterweight to the conclusions of a diverse, multidisciplinary, independent group of scientists who reviewed evidence for the better part of two years and relied upon knowledge and judgment cultivated over decades of relevant work - is nearly surreal. It is a disservice to the readership in both cases. It's unclear on what basis Dr. Katz believes that Ms. Teicholz is more motivated to sell her book and "to cash her royalty checks" than any other author. For example, what about this author? Of course, some authors do engage in questionable tactics. For example, last Autumn I tagged Dr. Katz for using two of his Huffington Post columns to hype reVision, a fantasy novel he wrote using a pseudonym. The problem? Dr. Katz didn't inform readers he was the author. He also posted five-star reviews for the book on Amazon and GoodReads under his own name without informing readers he wrote it. After my outreach to the Huffington Post, Amazon, and Goodreads, the columns and reviews were scrubbed. Defending public health IS my day job, and I do that with all the gusto I can muster. I trust, and hope, that devotion is evident in the hundreds, and indeed thousands, of blogs and columns I have written across many platforms - almost all, as a free public service. In the course of that duty, I had cause to call out the misrepresentations of an author [Nina Teicholz -- click the link] opposing the evidence-based and consensus-based recommendations of actual nutrition experts, and promoting her book into the bargain. I did not know this person - and still do not - and had no interest in confrontations about personhood or character. ...What I have learned since is something well known to those who care about diet, health, and related nutrition policy. The writer in question [Teicholz] is apparently backed by billionaires with ties to such enterprises as Enron, and the beef industry. ...This group is clearly very good at what it does. They have seemingly had a hand in persuading Congress to expunge sustainability from the Dietary Guidelines already. ...And that’s where the dots finally all connect. ...In the current case [his Huffington Post columns hyping reVision], it is now clear that the aspersions directed at me were of the “keep throwing dirt until something sticks” variety. ...Of course, glaciers are still melting; California is still running out of water. Storms are getting larger, temperatures rising, and biodiversity falling. There are ever more Homo sapiens, ever less of everything else that matters. And rabid ideologues, who have somehow perverted purposeless hatred into a religion, are wreaking the havoc of terrorism around the globe, and pose a threat to us all. And while on such happy topics, yes, national nutrition policy is imperiled by those who derive profits elsewhere, and yes - Congress has decided we may just go ahead and eat our children’s food. But we can all sleep better at night knowing that my two 2-year-old mostly unread (Huffington Post) columns about my mostly unread epic fantasy novel have been retracted. Or, maybe we can’t sleep better. But we can always just eat more cheese. 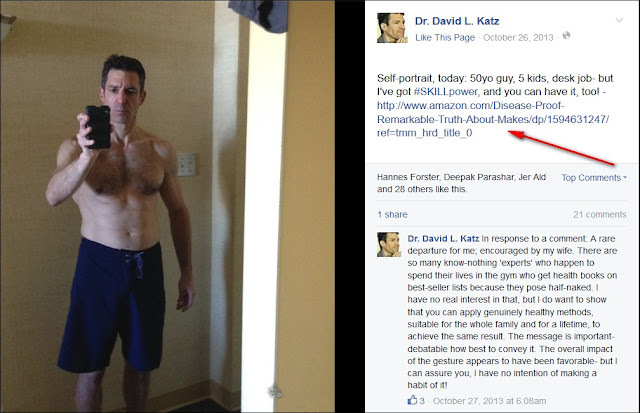 Dr. Katz's column did not acknowledge the five-star shill reviews for reVision which he posted on Amazon and GoodReads. Last year, along with other related questions, I asked him about that. He answered other questions, but ignored my questions about the book reviews. (Science) is about the incremental additions of each new study to what we knew before...But between us and that opportunity are the parasites of science who have no apparent interest in the weight of evidence, and instead feed selectively on studies depending on whether they endorse the opinion they’ve already decided is true. The "parasites of science" link leads to a critique of Ms. Teicholz's BMJ article. The "no apparent interest in the weight of evidence" link leads to Dr. Katz's "horse paperweights" critique of her BMJ article. The field of nutrition science must be protected from Ms. Teicholz whom he considers to be "an animal" and a "parasite" with "suspect motives" who doesn't care about the well-being of future generations. Motivated by book sales, her "shockingly unprofessional" work "reeks" with corrupt conflicts of interest and on multiple occasions he claims to have been present when the mere mention of her name caused "unanimous revulsion" among the "who's who" of nutrition science. It's unclear why Dr. Katz has resorted to such dehumanizing language, but it reminds me of this 2011 NPR report, 'Less Than Human': The Psychology Of Cruelty. For a follow-up item, I'd welcome any expert opinion. Click here for my contact information.